Ashley Brasfield, Stephanie Craze, and Claire Todd and Broadview students Tessa Baker (8), Lucie Baker (5), Sarah and Liam Downes (7), are happy that Broadview is getting the attention it deserves. Photo by Kate Settle. After years of working together and many late nights at Ottawa Carleton District School Board meetings, Westboro parents’ hard work has finally paid off. The province announced that Broadview Avenue Public School will receive funding for a rebuild, and the new school could open as early as the 2015-16 school year. The province made the announcement at the school on March 6. Education minister Liz Sandals confirmed that Broadview would be one of seven schools in Ottawa receiving funding totalling about $73 million. Craze says the plan is for students to stay in the current school while the new Broadview gets built on the same property, on the Dovercourt Avenue side. Broadview parent Molly Van der Schee says she is excited to hear the news, and that it was high time that the decision was made. Craze says the current building has had ongoing issues that students and teachers have had to deal with over time. Catherine Deschambault, who has been principal of the school for a year and a half, says the building is still safe for students but that Broadview staff are looking forward to seeing the school re-built. While Deschambault is thrilled to hear the news, she says the announcement means a lot of hard work will have to happen over the next couple years. “For me, I see it as a big, wonderful opportunity to play a part in creating a whole new school for the community, and it’s an opportunity that not many people get,” she says. Area school board trustee Jennifer McKenzie says she had been working on the Broadview re-build since she was elected in 2006. “I realized there was a tremendous need to invest in the school,” McKenzie says, adding that Broadview had been on the school board’s priority list since the 1980s. Going forward, she says the next steps will be to work with the community to finalize the design, and ensure it meets their needs. Craze says the core group of Broadview parents will also be meeting along the way, and have asked for community consultations so they are aware of the steps going forward. She adds that she would like to see the basics being met in the new building. Van der Schee agrees that accessibility will be very important to include in the new school – but she would also like to see it be a space where the community can come together. Yasir Naqvi, member of provincial parliament for Ottawa Centre, says the tendering process will also begin shortly – therefore the province cannot release the exact amount set aside for the re-build. Kitchissippi Ward Coun. Katherine Hobbs also attended the announcement, and says the reaction was very emotional. March 2009 – School board trustee Jennifer McKenzie presents at a city-wide forum on the need for capital investment in inner city schools. September 2009 – Early French Immersion (EFI) starts at Broadview, beginning with junior kindergarten to Grade 3 and grows by one grade each year from that point onward. 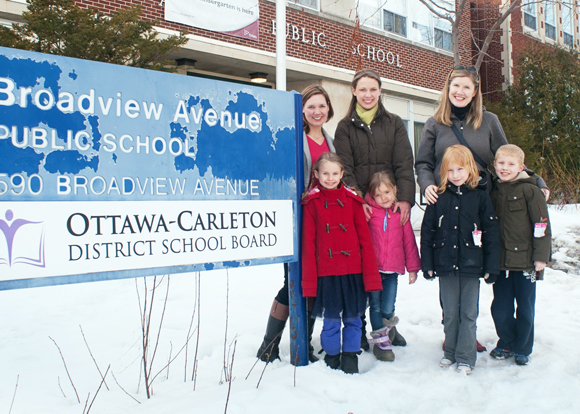 March 2012 – Parents urge school board officials to support a total reconstruction of Broadview at a public meeting hosted at the school. May 2012 – Broadview tops school board’s capital priorities list. The estimated the cost of re-build and demolition is $15 million. November 2012 – Ottawa Carleton District School Board staff complete regional consultation and programming review assessment. The recommendation to maintain boundaries and programming, following a review of adjacent schools and forecast enrolment, was accepted by the board in the winter of 2013. September 2013 – Implementation of full-day kindergarten exacerbates existing capacity and facility challenges. The neighbourhood is projected to grow, and as such, Broadview is expected to have 14 portables by 2015. March 2014 – Province announces funding to re-build Broadview. What does the Broadview rebuild mean to you? We’d love to hear your feedback.